Open to professionals internationally, Applied Arts Awards are Canada’s largest multi-disciplinary competitions. Submissions are currently accepted for 2018, for the Advertising Awards. Entry is open worldwide to all forms of commissioned, published, unpublished and personal work from professionals and enthusiasts created between January 2017 and August 2018. Only digital entries are accepted for this competition. 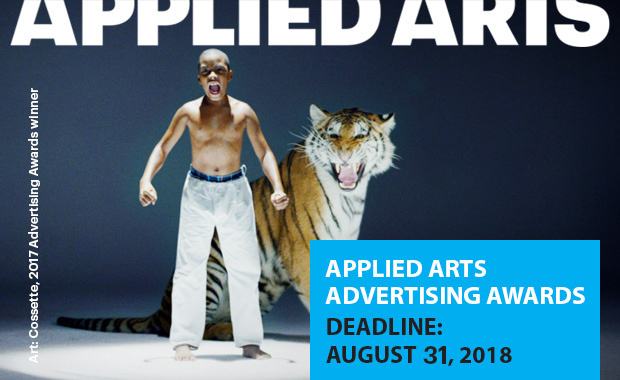 Applied Arts Advertising Awards are your best opportunity to promote your work to an audience of the best and brightest in the advertising industry as well as to potential clients. Applied Arts contests are judged by panels of highly regarded industry professionals and experts in a rigorous process. Every entry is scored independently on creative merit, technical excellence and suitability for end use. Launched in 1992, Applied Arts Awards are the only competition in Canada that recognize the creative work of professionals across the visual communications sector. Over the past 25 years, the Applied Arts Awards have become an international recognition of creative excellence. All entrants will be notified in October 2018 via email. At that time, those selected as winning entrants will be required to submit high-res digital files for reproduction in the Advertising annual. Winners’ certificates will be mailed separately after the Advertising annual is published.